Since the release of iOS 4, iPhone 3G users have been complaining about poor performance prompting frustrated users to voice their complaints in videos like the one above. Some of the common problems experienced after installing iOS 4 on the iPhone 3G include overall slow system responsiveness and issues when typing, zooming, and scrolling. 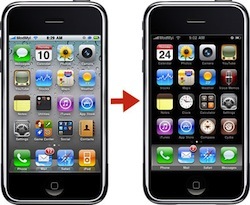 Today, our friends at 9to5mac are reporting that Steve Jobs has responded to a frustrated iPhone 3G user, saying only that there will be a “software update coming soon”.